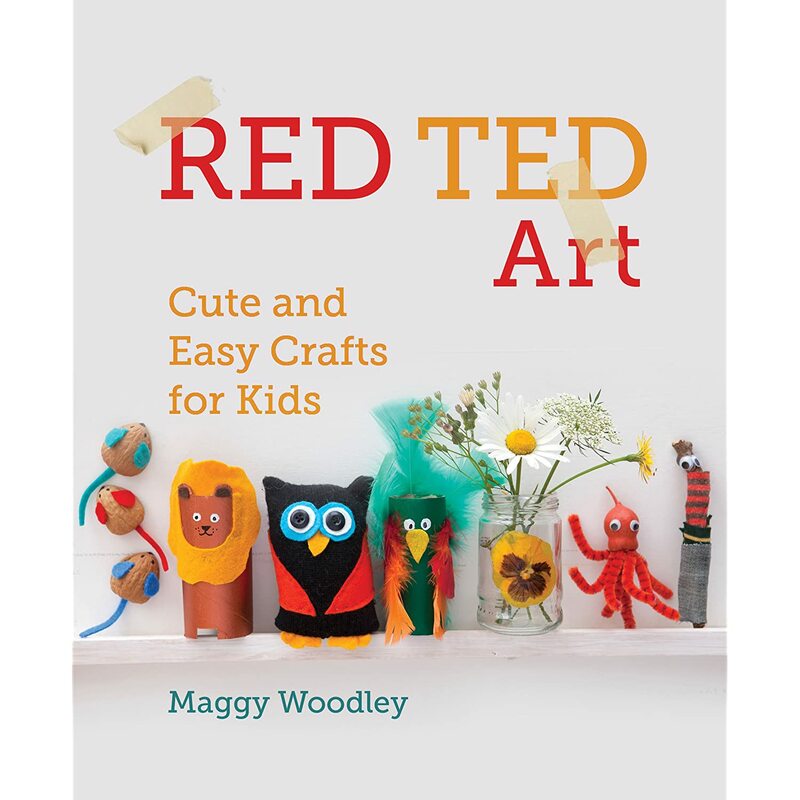 Maggy Woodley’s brand new and very first book Red Ted Art; Cute and easy crafts for kids is due for release next week. I was so excited to receive it for review. Maggy writes the most popular craft blog in the UK, Red Ted Art and I have followed it for about 4 years. Her aim has always been to ‘bring colour and art to children’s hearts’. She is great at what she does and she has a fabulously frugal attitude. How about making her gorgeous hobby horse for just 50p! I have met Maggy and she is warm and creative and has a very good understanding of children and their artistic development. She was perfectly placed to write a craft book and I was excited to receive it. Let me tell you it was everything I wished it to be. Throughout this lovely hardback book Maggy uses recycled materials and nature to create 60 wonderful craft ideas for you to make with your kids. These include bubble wrap trees, egg carton fairy lights, fabric mache bowls, stick men and felt strawberries, loo roll people, sock monkeys, conker pencil toppers, stone people, and many more.. The book is full of gorgeous photos and a diverse range of crafts, it is a real treasure. The crafts are delightful and would make sweet gifts and toys. Our whole family got involved in making a spring picture inspired by Maggy’s bubble wrap trees. 5 years olds and 40 year olds had 3 hours of crafty fun together on a cold rainy, Sunday afternoon. We are so proud of our spring collage! I love the layout of the book; you are given step by step EASY instructions on how to make the crafts and these can be adapted for the very young or for older children as required. To my mind this is the best £10 you could spend on your kids this year. It will bring you hours of togetherness and fun, it will encourage their creativity , imagination and fine motor skills. and you can make a batch of gifts that will be adored very cheaply. A huge thumbs up from baby budgeting for Red Ted Art. A wonderful effort from Maggy Woodley! I love your spring collage! H and I are going to create something tomorrow, I am very excited! Danni from It started with a Squish (@witches_rave) recently posted..Win a family ticket to Cbeebies Justin & Friends Live tour! oooooooh I can’t wait to get my hands on a copy! I love your collage! Thank you for all your support on this. You are amazing and a super star!! Really, you are!!! !